The Outlook Junk Email Filter checks the sender of every incoming message against lists of email addresses and Internet domains — the part of the email address after the @ symbol — designated either as safe or to be blocked. Customize the filter to block or allow senders or message types. To add a person to the Safe Senders List, click a message from the sender, and then click Home. In the Delete group, click Junk, and then click Never Block Sender. To add an email address or domain to the Safe Recipients List, click a message from the sender, and then click Home. In the Delete group, click Junk, and then click Never Block this Group or Mailing List. If you want all Contacts to be considered safe senders, select the Also trust email from my Contacts check box on the Safe Senders tab. Some people whom you correspond to might not be listed in your Contacts. If you want all such people to be considered as safe senders, select the Automatically add people I email to the Safe Senders List check box. Messages from email addresses or domain names in the Blocked Senders List are always treated as junk. Outlook moves any detected incoming message from senders in the Blocked Senders List to the Junk Email folder, regardless of the content of the message. Note: The Outlook Junk Email Filter doesn’t stop junk email from being delivered, but instead diverts suspected spam to the Junk Email folder. You can change the sensitivity of the Junk Email Filter by changing its level of protection, or use third-party solutions, which can be more aggressive. To add someone to the Blocked Senders List, click a message from the sender, and then click Home. In the Delete group, click Junk, and then click Block Sender. You might find that unwanted email messages come from particular countries/regions. 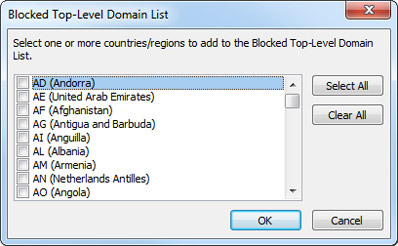 By using the Blocked Top-Level Domain List, you can block messages from those areas. 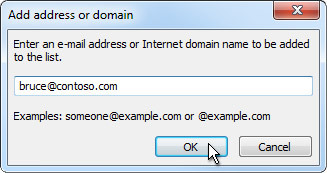 This list blocks messages from email addresses that end in a particular top-level domain or country/region code. For example, selecting the CA [Canada], US [United States], and MX [Mexico] check boxes in the list blocks messages where the sender’s email addresses ends in ca, us, or mx. Additional country/region codes appear in the list. Click OK in both open dialog boxes. You can block all email message by language encodings — also known as character sets or alphabets. Today, most junk email is sent in the U.S.-ASCII encoding. 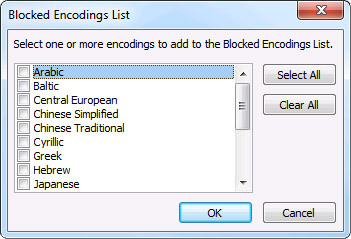 By using the Blocked Encodings List, you can filter out unwanted email messages that are displayed in languages that you don't understand. In the Delete group, click the arrow next to Junk, and then click Junk Email Options.